As settler-colonists began to move into the region in the mid-1850s, the need for safe and reliable crossings drove the construction of bridges along the river. The Root River, a tributary of the Upper Mississippi River, flows for 80 miles through several towns of southeastern Minnesota including Rushford, Preston, and of course, Forestville. This river crossing at Forestville saw the evolution of three separate bridges over time. In 1856, three residents, William Renslow, Gilbert Bassett, and William Meighen, contracted with fellow newcomer Major Foster to construct a bridge directly across from the Fremont House, the town's first hotel. He built a rugged bridge in the “King’s Post” style, made out of native white oak. They completed the project on May 6, 1856. The bridge lasted for 32 years until 1888, when floods washed it away. The townspeople quickly erected a new bridge in the same location. They built it in the same “King’s Post” style as the original bridge, and used a heavy timber construction and wood plank flooring. This time, they included a “broadside,” or advertisement, near the top of the left supporting truss advertising products in the town store. 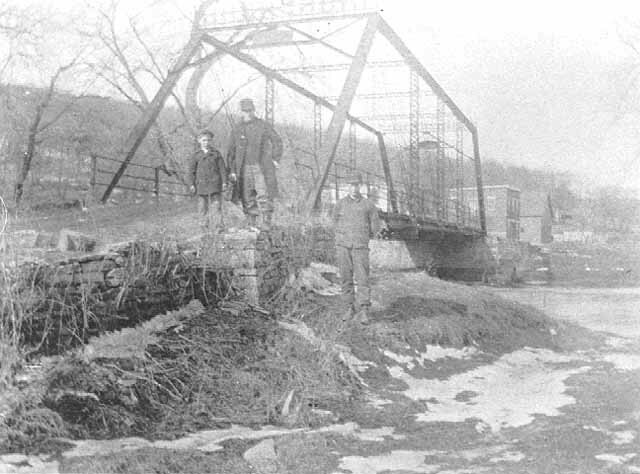 This second bridge lasted until 1898. The Gillette-Hertzog Manufacturing Company of Minneapolis constructed the third bridge at the Forestville crossing during the spring of 1899. This new structure and a matching bridge constructed a mile to the south were the last construction projects of the 19th century at Forestville. The bridges were funded entirely by Forestville Township residents. The bridge's structural members were made of Carnegie steel fitted with wood plank decking. 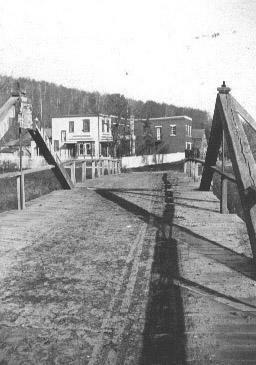 Placed across two dressed limestone piers, the bridge cut an impressive figure and signaled a somewhat tardy arrival of the Gilded Age to Forestville. The bridge was turned over to Fillmore County in the 1970s and may be be the oldest surviving bridge in the county. Aside from trees that have since grown up on both sides of the river, this view has remained relatively unchanged. Today visitors can park their cars on the south side of the river, then walk across the bridge to Historic Forestville. Second bridge at Forestville, October 1897. Third Forestville bridge, circa 1900. Third Forestville bridge, circa 1900. Source: MNHS Collections.